Is your Law Firm facing an issue that requires specialized substantive expertise? Is your Legal Department in need of a new Contract Management solution? From handling complex legal issues to new legal technologies to an internal team that is too busy to start new projects… all are reasons to issue an RFP for legal services. An RFP or Request for Proposal is a document that a Company posts to generate bids from potential law firms or vendors for a specific, desired solution. The RFP document details exactly what the Company is looking for and outlines a method to evaluate and assess the submitted proposals fairly. The first step in issuing your RFP is to put together your team! Your internal team will have varying responsibilities including but not limited to drafting the RFP document, locating firms or vendors, reviewing proposals, and selecting the right firm. Your team will have to identify key stakeholders to lay out organizational goals and objectives. Most importantly, the team must establish a budget and a timeline that will help guide your evaluation process. Drafting the Request document is generally the most difficult and time-consuming task of the RFP process. Most companies reference canned templates that prove too simple and vague, and thus illicit too many generalized responses. Other RFPs styles can be cumbersome and complicated which can result in ‘would be’ (yet qualified) responders to run with fear! The best drafted RFPs are clear, concise, and organized. Drafters should explain the purpose or background of their project, lay out the scope of work required, detail finances such as payments or incentives, and explain the process for evaluation and reward. Finding target law firms or vendors to respond to your request can be a dauting task, to say the least. Your team should do their due diligence, research firms in order to understand not only their qualifications, but their weaknesses and shortcomings. Most law firms will be familiar with your organization however; do not limit your list of qualified vendors only to those with whom you have prior working relationships. At the same do not “bid shop” and end up drowning in a sea of unqualified vendors. Remember, part of the RFP process is fairness; target your invitations to those that are qualified and capable of completing the task at hand. Also keep in mind that your team is responsible for the administration and evaluation of the responses. Your budget will quickly be exhausted if you cast your net too far and too wide. Evaluating responses must be done methodically to ensure accuracy and fairness. Generally, the process laid out by your team should contain a “scoring” or “scorecard” method where criteria are weighted and evaluated based on needs and priorities. Based on the scorecard, law firms or vendors can more easily be shortlisted and/or eliminated. Be sure to check certifications (diversity, information security, etc), completed cases, specializations, conflicts, and Alternative Fee Arrangements (AFA). From your short list, you can then request interviews and supporting documentation to help you further narrow, evaluate and select the finalist that can best provide a solution for your team and your company. Although you have selected a firm, the negotiation process is just beginning. At the end of the day, responses are merely proposals that can be accepted or declined. 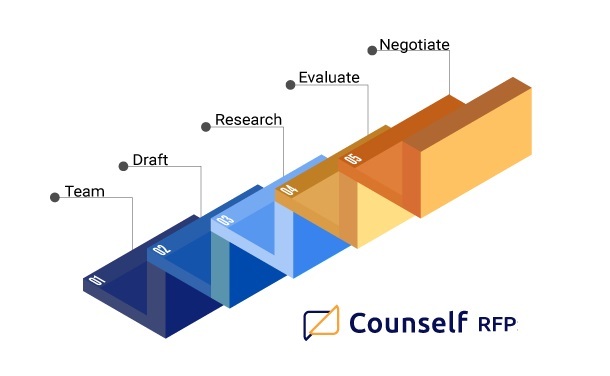 You can continue to refine the scope based on information discovered during the RFP process, and as your team has developed their understanding of the project. After negotiations, your legal team will finalize and execute an Agreement or Statement of Work, thereby ending the Request for Proposal process.